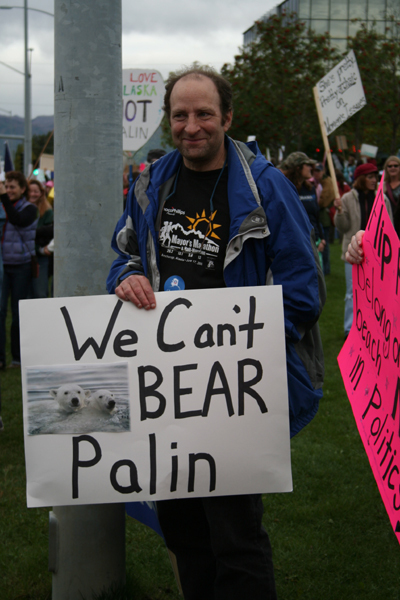 [The] Alaska Women Reject Palin rally was to be held outside on the lawn in front of the Loussac Library in midtown Anchorage. 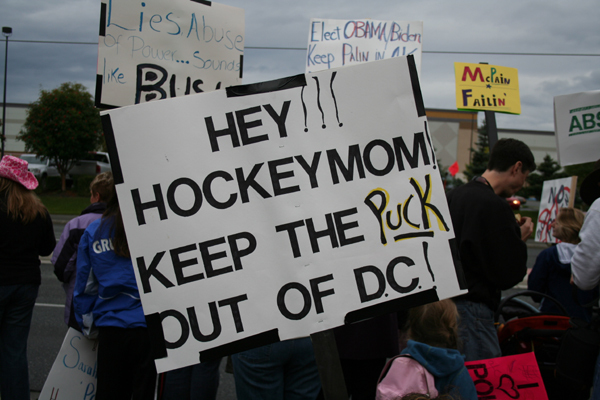 Homemade signs were encouraged, and the idea was to make a statement that Sarah Palin does not speak for all Alaska women, or men. I had no idea what to expect. The rally was organized by a small group of women, talking over coffee. It made me wonder what other things have started with small groups of women talking over coffee. It’s probably an impressive list. These women hatched the plan, printed up flyers, posted them around town, and sent notices to local media outlets. One of those media outlets was KBYR radio, home of Eddie Burke, a long-time uber-conservative Anchorage talk show host. Turns out that Eddie Burke not only announced the rally, but called the people who planned to attend the rally “a bunch of socialist baby-killing maggots”, and read the home phone numbers of the organizers aloud over the air, urging listeners to call and tell them what they thought. The women, of course, received some nasty, harassing and threatening messages. I felt a bit apprehensive. I’d been disappointed before by the turnout at other rallies. 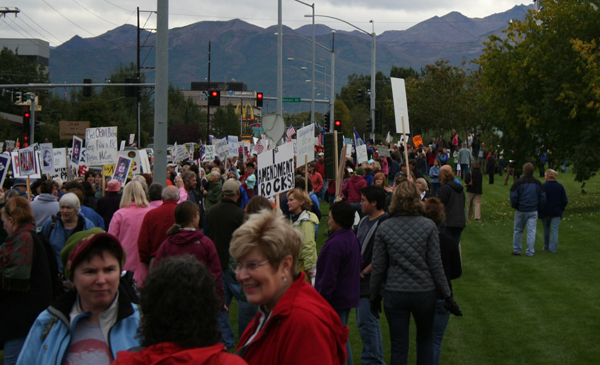 Basically, in Anchorage, if you can get 25 people to show up at an event, it’s a success. So, I thought to myself, if we can actually get 100 people there that aren’t sent by Eddie Burke, we’ll be doing good. A real statement will have been made. I confess, I still had a mental image of 15 demonstrators surrounded by hundreds of menacing “socialist baby-killing maggot” haters. It’s a good thing I wasn’t tailgating when I saw the crowd in front of the library or I would have ended up in somebody’s trunk. 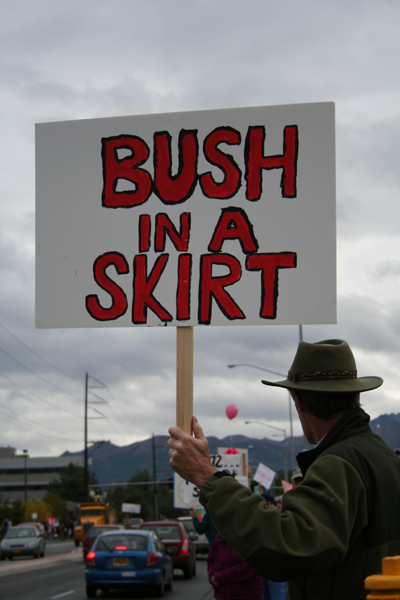 When I got there, about 20 minutes early, the line of sign wavers stretched the full length of the library grounds, along the edge of the road, 6 or 7 people deep! I could hardly find a place to park. I nabbed one of the last spots in the library lot, and as I got out of the car and startedwalking, people seemed to join in from every direction, carrying signs. Never, have I seen anything like it in my 17 and a half years living in Anchorage. The organizers had someone walk the rally with a counter, and they clicked off well over 1400 people (not including the 90 counter-demonstrators). This was the biggest political rally ever, in the history of the state. I was absolutely stunned. The second most amazing thing is how many people honked and gave the thumbs up as they drove by. 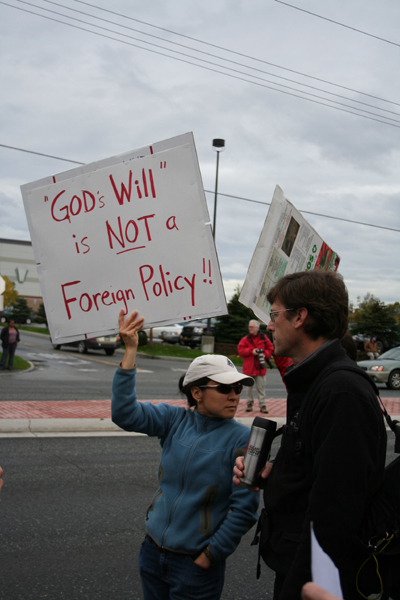 And even those that didn’t honk looked wide-eyed and awe-struck at the huge crowd that was growing by the minute. This just doesn’t happen here. Then, the infamous Eddie Burke showed up. He tried to talk to the media, and was instantly surrounded by a group of 20 people who started shouting O-BA-MA so loud he couldn’t be heard. Then passing cars started honking in a rhythmic pattern of 3, like the Obama chant, while the crowd cheered, hooted and waved their signs high. So, if you’ve been doing the math… Yes. 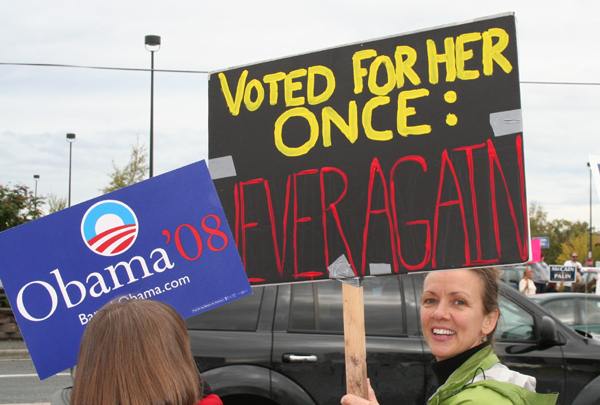 The Alaska Women Reject Palin rally was significantly bigger than Palin’s rally that got all the national media coverage! So take heart, sit back, and enjoy the photo gallery. Feel free to spread the pictures around to anyone who needs to know that Sarah Palin most definitely does not speak for all Alaskans. The citizens of Alaska, who know her best, have things to say. ~ by Eric Harrington on September 17, 2008. Since Eddie Burke used the KBYR Radio Station in essence to announce to the world that was listening to call the organizers and send hate through the phone. I would suggest that the organizers who received the phone calls, hire an attorney and sue Eddie Burke and KBYR Radio Station for slander.